AUSTRALIA, C. 1914. 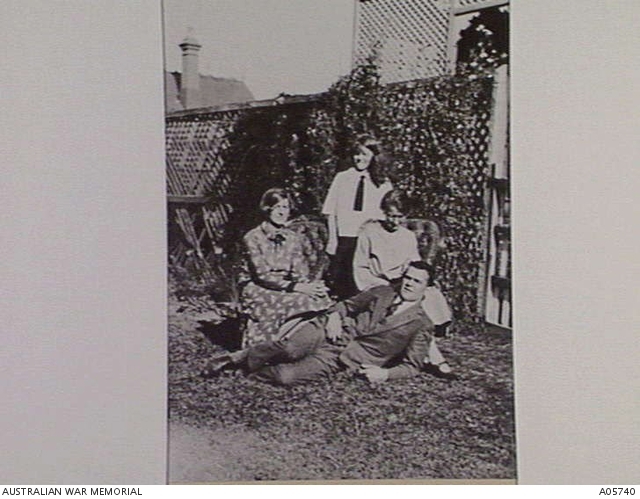 OWEN HOWELL- PRICE, WHO SERVED IN WORLD WAR 1 WITH THE 3RD BATTALION, AT HOME IN THE GARDEN WITH HIS MOTHER AND TWO SISTERS. AUSTRALIA, C. 1914. RICHMOND AND OWEN HOWELL- PRICE AT HOME BEFORE THE WAR. RICHMOND SERVED IN WORLD WAR 1 WITH THE 1ST BATTALION AND OWEN WITH 3RD BATTALION. Gallipoli Peninsula, Turkey. October 1915. 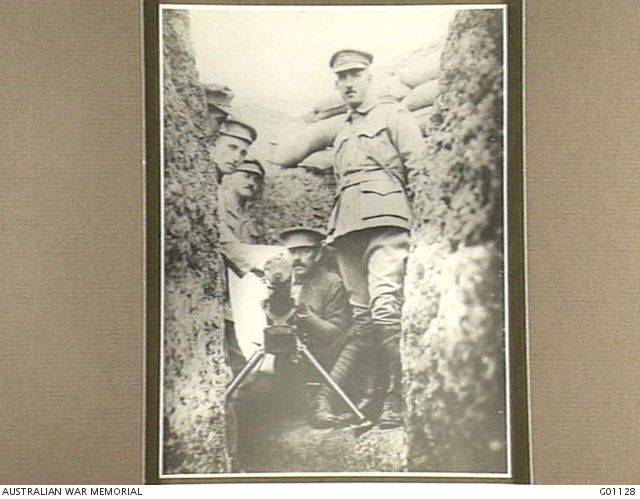 A machine gun taken from the Turks by the 3rd Battalion. 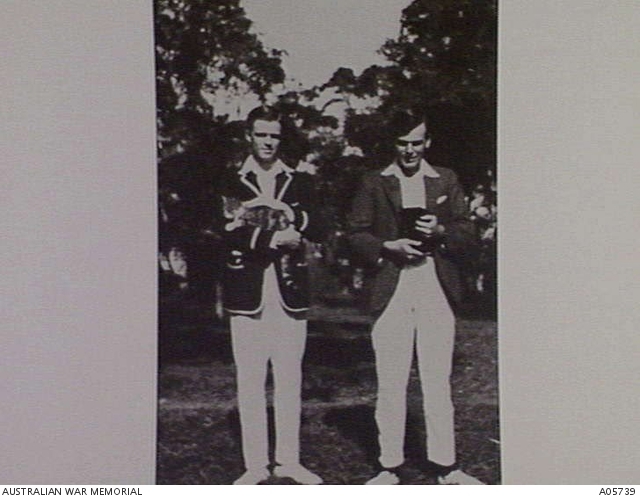 Major Howell-Price, commanding the battalion, who left Australia as its junior subaltern, is on the right. The officer on the left is Lieutenant Goldenstedt. STUDIO PORTRAIT OF LIEUTENANT COLONEL (LT COL) OWEN GLENDOWER HOWELL-PRICE DSO MC. LT COL HOWELL-PRICE WAS COMMISSIONED AS A SECOND LIEUTENANT IN THE 3RD BATTALION AND SUBSEQUENTLY SERVED AT GALLIPOLI WHERE HE WON THE MILITARY CROSS AND WAS MENTIONED IN DESPATCHES. DURING JULY AND AUGUST 1916 HE FOUGHT AT POZIERES AND MOUQUET FARM, FRANCE, WHERE HE WAS AWARDED THE DISTINGUISHED SERVICE ORDER AND WAS AGAIN MENTIONED IN DESPATCHES. HE DIED OF WOUNDS ON 4 NOVEMBER 1916 NEAR FLERS, FRANCE. 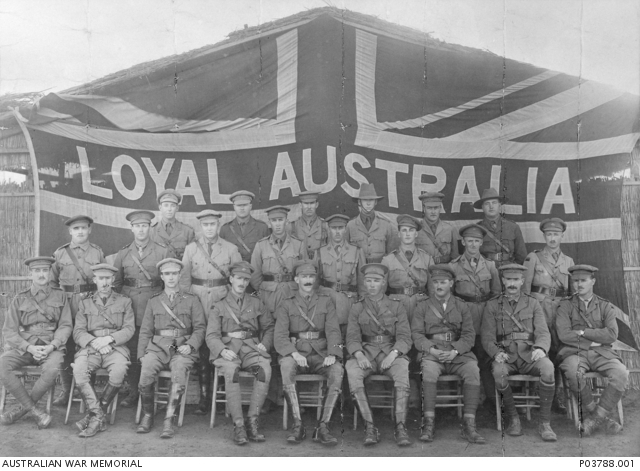 Group portrait of officers of the 3rd Battalion in front of a large Union Jack flag bearing the words ‘Loyal Australia’ across the middle. Identified is Lieutenant (Lt) Owen Glendower Howell-Price MC (front row, fourth from left) and Lt Norman Gibbins (front row, second from right). 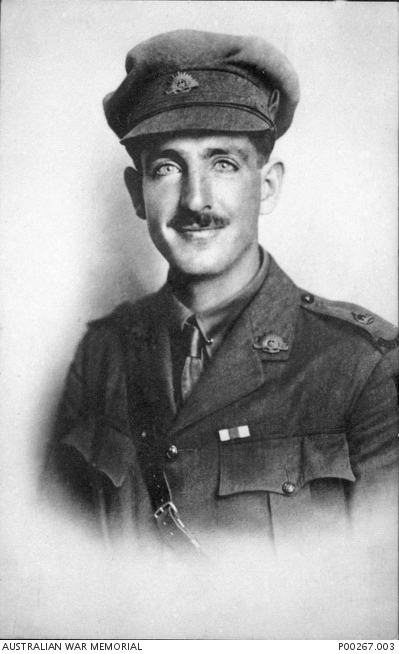 Lt Howell-Price was later promoted to Lieutenant Colonel and command of the 3rd Battalion; he was killed in action on 4 November 1916. Lt Gibbins, later promoted to Captain and transferred to the 55th Battalion, was killed in action on 20 July 1916 at Fleurbaix, France. Autographed portrait of three officers of the 3rd Battalion in full kit including their bed rolls slung across their chests. 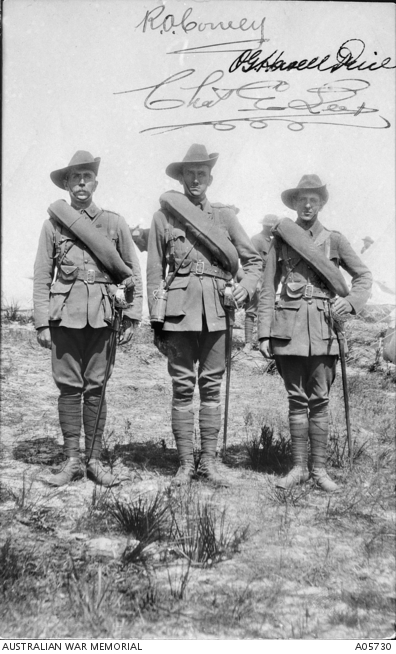 Left to right: Captain Charles Edward Leer, 2nd Lieutenant Robert Orlando Cowey, 2nd Lieutenant Owen Glendower Howell-Price. Leer was killed in action on 1915-04-25. Howell-Price served on Gallipoli where he won the Military Cross and from July 1916 he fought in France where he was awarded the Distinguished Service Order. He was killed in action on 1916-11-02. 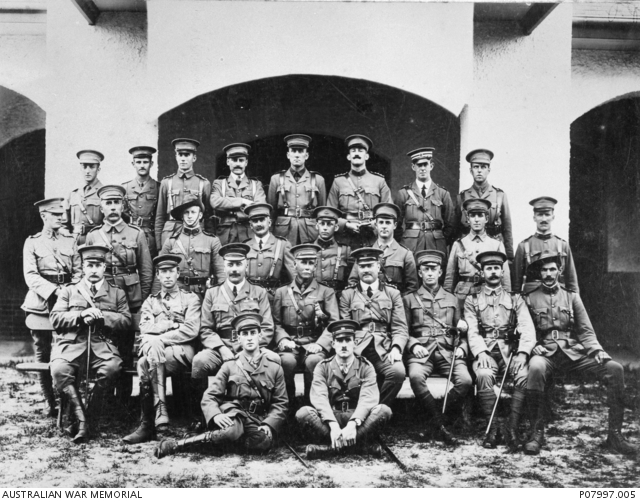 Group portrait of officers of the 3rd Battalion. Back row, left to right: Second Lieutenant (2nd Lt) Cedric Errol Meyer Brodziak (later awarded DSO; killed in action 31 August 1918); Lieutenant (Lt) Ronald Burns (killed in action 25 April 1915); 2nd Lt William Christian Beeken (killed in action 6 August 1915); Lt John Carandini (Carrandine) Wilson (died of wounds 21 May 1915); Lt Robert Orlando Cowey; Lt (Honorary Captain) David McFie McConaghy (later awarded DSO and CMG; died of wounds 9 April 1918); 2nd Lt Leonard Ken Stevenson and 2nd Lt Lawrence (Laurence) Whistler Street (killed in action 19 May 1915). Second row: Captain (Capt) Charles Edward Leer (killed in action 25 April 1915) ; 2nd Lt Edward MacFarlane MacFarlane (died of wounds at sea 2 August 1918); Lt (Honorary Captain) Colin Douglas Austin (killed 6 August 1915); 2nd Lt Harold Edmund Butler; Lt Eric George Goldring; 2nd Lt Owen Glendower Howell-Price (later awarded DSO and MC; died of wounds 4 November 1916) and Lt George Edward McDonald. Front row, seated on bench: Honorary Lt George Wall; Capt John Willoughby Butler Bean, Medical Officer (MO); Major Alfred Joshua Bennett (later awarded CMG); Lieutenant Colonel Robert Haylock Owen, Commanding Officer (later awarded CMG); Captain Ernest Samuel Brown (killed in action 6 August 1915); Capt Malcolm St John Lamb; Capt Thomas Oscar Smith (killed in action 7 May 1915) and Capt William Bowman Douglas (died of wounds 5 May 1915). At front, seated on ground: 2nd Lt Harold William Goldring and 2nd Lt Kenneth John Hinde (killed in action 5 May 1915). The original contingent of the Third Battalion embarked from Sydney on 20 October 1914 on HMAT Euripides (A14). (See P08567.002 for another print portrait with names inscribed).